Whether you are the bride or groom or someone who is helping in the wedding preparations, you know it is not easy to make all the arrangements given the limited time to prepare. However, you do not need to worry for we are here to help you in some areas of the preparations for the wedding, such as the wedding banners. 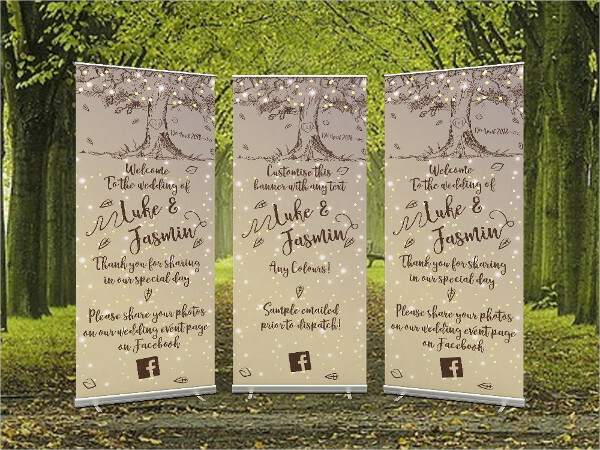 Welcome your guests with beautiful wedding banners that feature a personalized greeting or message or a photo of the happy couple with the use of the banner templates contained in this article. Surely, wedding banners will become a significant part of the wedding celebration not just as a decoration but also as a memorable keepsake of the newly married couple that they can cherish and treasure forever. 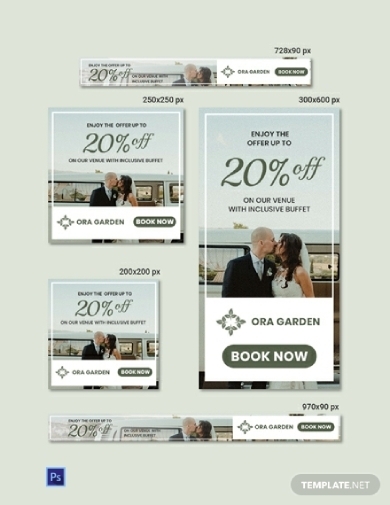 When you are running a business related to providing wedding services and products, such as wedding invitations, flyers, announcements, and even menus, the best promotional material that you can post on your website, as well as in other sites, is the wedding banner ad. 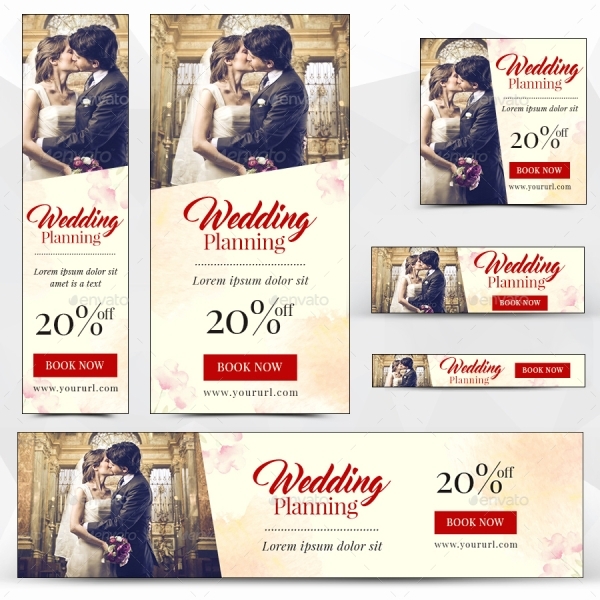 In order to create one that will surely attract customers and potential clients, you can use this creative wedding web banner template which you can easily edit according to your specific preferences. This is available in Photoshop file format, hence very convenient for every user to customize the design. 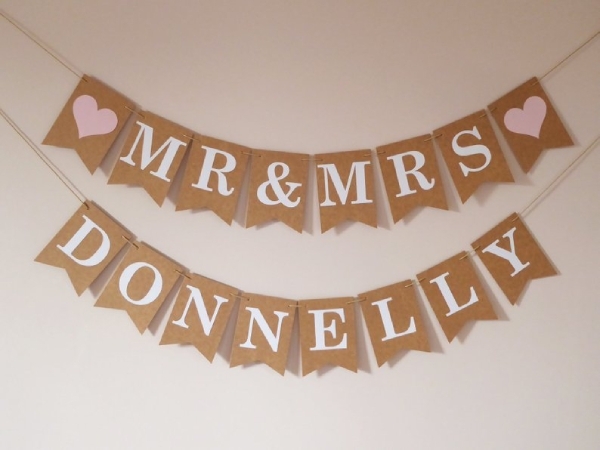 As an addition to the decoration at your wedding venue, you can customize your own wedding banner by referring to this personalized wedding banner example. While this can be placed outdoors or in an open space, it is best to use this decoration indoors so it would not be easily destroyed by heat or moisture. In this example, the white-colored text in serif font is being complemented with kraft paper, making it appealing and easy to read. Strings are also attached holding all the letters so it would be easy to hang the banner in walls or fences. Get more artsy when it comes to designing your banner, and use this example as a reference whenever you create one. Apart from white and brown, you can explore other different colors that complement well with each other or those colors related to the color motif of the wedding. Typically, these are pastel or pale colors, for example, soft millennial pink, whimsy yellow, light azure, and creamy mint. When you use pastel colors for the text, it is better if you use a dark-colored background. Conversely, when you are using dark-colored paper for the text, the background must be in soft colors. 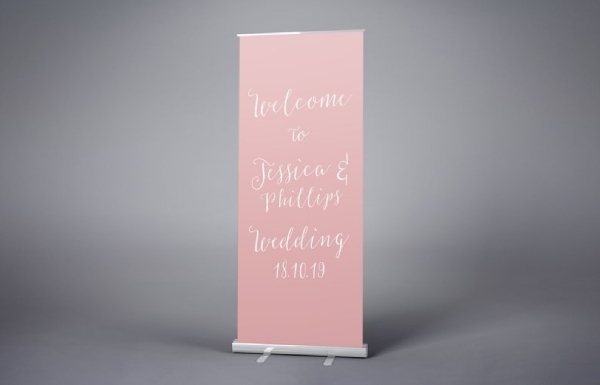 Roll-up banners, also called pull-up roller banners, pop-up banners, stand banners, or exhibition banners, is a perfect display for your wedding which serves as a welcome sign to the guests and visitors. 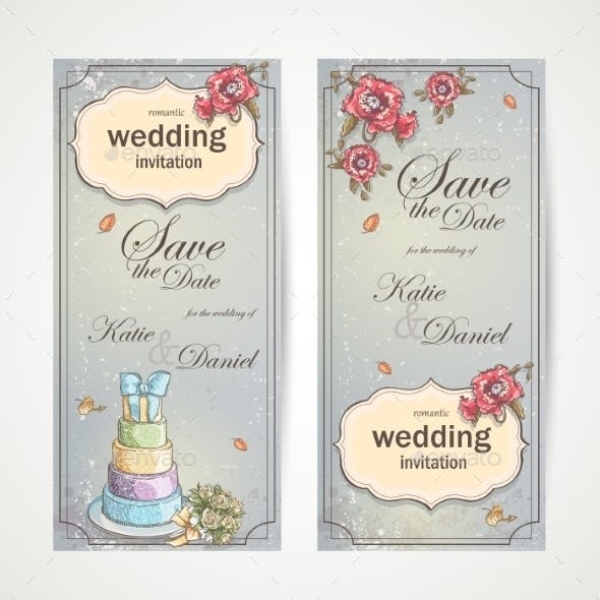 You can write the names of the couple and the date of the wedding on the face of the banner, and you can also include a photo of the happy couple, florals, and other decorations appropriate for the wedding event. Regardless of whether you want an extravagant design or a minimalist one, such as the example above, the message on the banner is important, so put extra effort not just on the design but on the content as well. 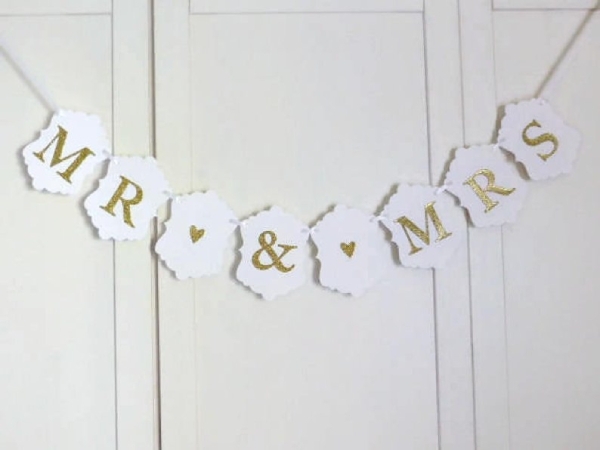 This simple white-and-gold wedding banner is perfect to be hung on the doors of the wedding venue, which serves as a wedding decoration and to welcome the invited guests at the wedding celebration. For weddings that are held at reception wedding halls, this would inform the visitors of the specific room that the reception is held. 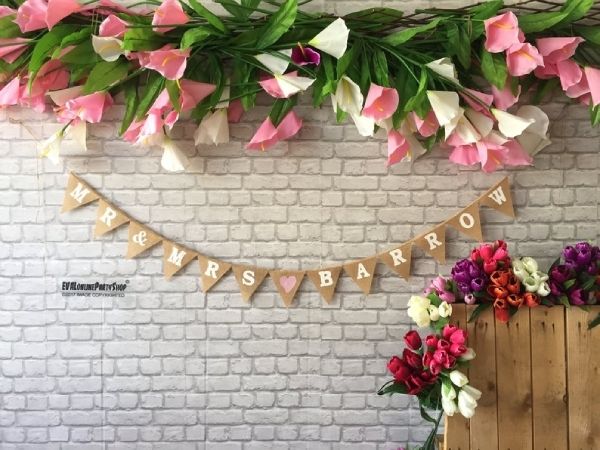 When you craft your own wedding banner, choose the appropriate colors complementing the colors for the other decorations in the wedding reception hall. 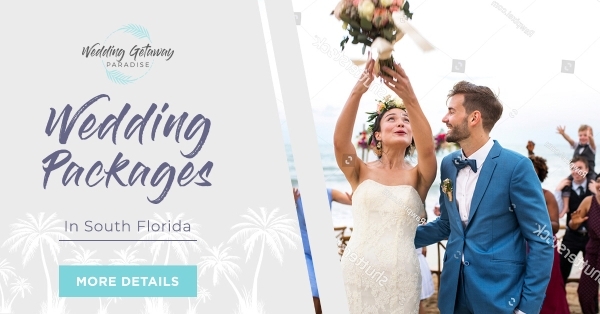 If you are providing wedding planning services, one of the most effective ways to promote your business is through the use of a wedding web banner, similar to this elegant wedding web banner example. You can post this on your own website or you can partner with other websites that accept banner ads. In this way, you will expand the reach of your marketing materials and you make your branding known to the public. Do not forget to include high-quality photos of the wedding services that you are offering as well as the great deals that are hard to refuse by the customers. Link the banner ad to your website so that users will be redirected to your main site where they can browse the complete details of your offer. Vertical banners are not only appealing to the viewers; they are also perfect when the space for the wedding venue is limited since they are placed vertically, hence conserving space. If you want to create one, do not forget to incorporate high-quality illustrations related to the wedding as it provides more appeal and it enhances the visual presentation of the banner. 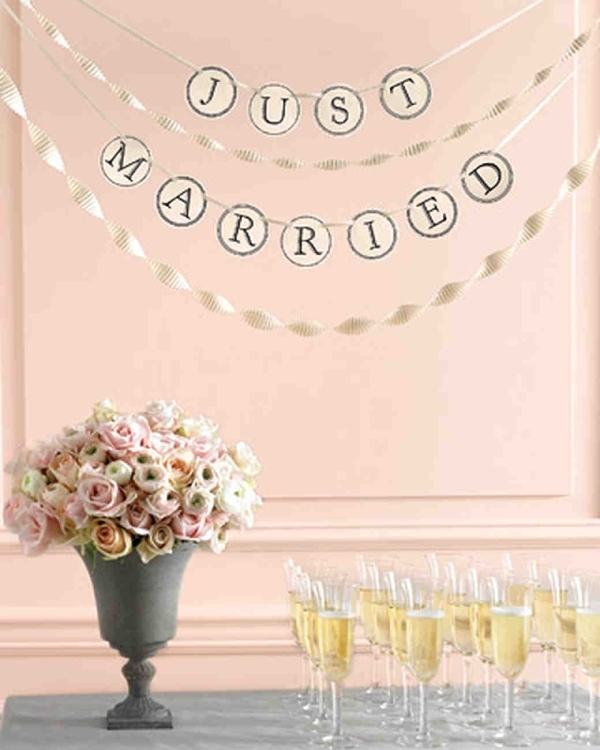 You can refer to the example above for a striking vertical wedding banner. This wedding roll-up banner best suits those wedding ceremonies that are held outdoors. While you are working on the design, you must not forget to choose high-quality material where you print your design as well as a sturdy stand that will support your banner. Do not just settle for less, especially when it is for the decoration of the event that marks another milestone of your life. We all know that Facebook has become one of the top social media sites browsed by a lot of people. Because of the huge audience of Facebook, this has become a platform for advertisers and marketers. So when you are offering wedding packages and other services, post this advertisement on Facebook with the use of a Facebook wedding banner, just like the example presented above. If you want a cost-effective decoration for the wedding reception, this pastel wedding banner is what you are looking for. Because it is relatively small in size, the cost for printing is expected to be cheap. Alternatively, you can create your own personalized banner according to your specific preferences.